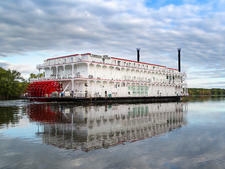 Following on the success of the introduction of American Duchess on the Mississippi in 2017, American Queen Steamboat Company (AQSC) purchased a former gambling boat -- the Kanesville Queen -- and substantially refitted it, stripping it down to its steel frame and adding a new 60-foot midsection and the company's now-trademark red paddlewheel at the stern. The result: American Countess. While the hull might date from 1995, the rest is essentially a brand-new ship. It debuts in 2020. Predominantly based on the Lower Mississippi, the new American Countess will enable AQSC to operate even more river cruises along this most historic of American waterways. With most of its ships running at full capacity, the extra berths are welcomed for those looking to cruise to the heartland of the United States. While American Duchess introduced a more contemporary look in terms of its onboard decor and color schemes, AQSC says that American Countess will be a return to the more classical decor found aboard the line's other ships, American Queen and the Columbia River-based American Empress. The ship will also have several smaller lounges in order to accommodate groups and charters. The company is adding a paddlewheel to the vessel. Like AQSC's other ships on the Mississippi, American Countess will feature inside and balcony staterooms. Included shore excursions will be featured in every port of call, serviced by AQSC's own fleet of branded motor coaches that operate a hop-on, hop-off-style tour in many ports of call. 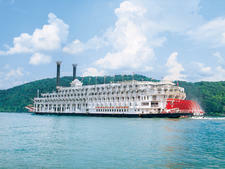 An included pre-cruise hotel stay is also featured on most itineraries. On the dining front, complimentary beer and wine are served with dinners onboard, which can be enjoyed in the main dining room. Breakfast, lunch and dinner are served in an open-seating environment, and the American Countess will feature a separate specialty dining venue like the rest of her fleetmates. Complimentary cappuccino, espresso, bottled water and soft drinks are included throughout all voyages aboard American Countess. Exact features and amenities for American Countess, along with specific stateroom categories and descriptions, will be revealed by AQSC at a later date. American Countess will primarily make its home on the Lower Mississippi, operating a variety of voyages that travel from Memphis to New Orleans or reverse. Typically, nine days in duration, these itineraries focus on the romance and the spirit of the so-called Antebellum South. Sail through the heart of the territory that is home to the Natchez Indians and early French explorers and discover the history of the American Civil War in Vicksburg, Mississippi. 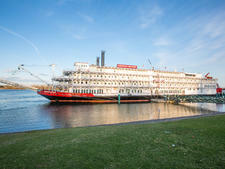 The 223-passenger paddlewheel boat is the largest sailing the rivers of the Pacific Northwest. Features a decidedly Victorian decor and large cabins. The 436-passenger American Queenis is delightful and feels more like a small and historic boutique hotel than a riverboat. The ship's six decks are swathed in swirly white gingerbread trim.